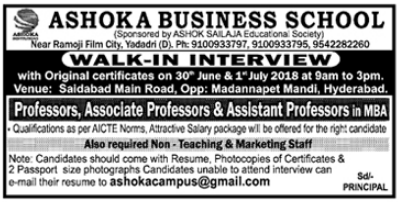 Ashoka Business School, Hyderabad has advertised in the DECCAN CHRONICLE newspaper for the recruitment of Professor / Associate Professor / Assistant Professor jobs vacancies. Interested and eligible job aspirants are requested to walk-in on 30th June 2018 and 01st July 2018. Check out further more details below. About College: The college is setup amidst lush green natural surroundings with a true pearly white building. To look at, AIET is a commitment with joy. This college was established in the year 2009. The basic philosophy of the Institute is to provide quality technical education with thorough practical knowledge. Its aim is to employ innovative teaching methods which carry an emphasis on fast changing technological trends. The college aims to encourage students from the first year B.Tech itself, to identify suitable work areas and to execute projects of their own choice and interest. The teaching-learning process is carried-out through the use of overhead and LCD projectors. How to Apply: Interested and eligible candidates are requested to appear for the Walk-in interview along with CV, originals / copies of educational certificates and 02 recent passport size photographs to the following Walk-in address. Candidates can mail their resume to the email address if unable to attend the interview.